Olx.co.za - Is OLX South Africa Down Right Now? The above graph displays service status activity for Olx.co.za over the last 10 automatic checks. The blue bar displays the response time, which is better when smaller. If no bar is displayed for a specific time it means that the service was down and the site was offline. Having Problems with Accessing Olx.co.za? Is Olx.co.za down for you right now? Submit your comments about Olx.co.za service status or report an issue below to let others know that they aren't the only ones having trouble. Please note that your country, service provider and browser information will be displayed next to your comment to better analyze a possible outage. 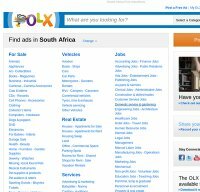 Olx.co.za has been rated 1.4 out of 5 points. A total of 8 votes cast and 3 users reviewed the website. Server is up. Last checked 1 day 2 hours ago. Server is up. Last checked 3 days 10 hours ago. Server is up. Last checked 5 hours 6 mins ago. Server is up. Last checked 2 days 22 hours ago. Server is down. Last checked 4 days 4 hours ago. Server is up. Last checked 1 hour 22 mins ago. Server is up. Last checked 1 hour 12 mins ago. Server is up. Last checked 1 day 23 hours ago. Server is up. Last checked 1 day 1 hour ago. Server is down. Last checked 32 secs ago. Server is down. Last checked 2 mins ago. Server is down. Last checked 3 mins ago. Server is down. Last checked 4 mins ago. Server is down. Last checked 11 mins ago. Server is up. Last checked 2 secs ago. Server is up. Last checked 4 secs ago. Server is up. Last checked 6 secs ago. Server is up. Last checked 11 secs ago. Server is up. Last checked 22 secs ago.